Have you had your say in the Cyclingnews 2014 awards yet? OK so we’re likely to see the usual suspects winning but it’s at least a truly democratic selection and representation of armchair fans’ views. For what it’s worth the VCSE voting form went something like this.. This was a bit of a toss up between Contador and the Shark. We held our nose about picking Chris Froome as pre-race Tour favourite this year even though Bert looked like the stronger of the two. What most people didn’t expect was that Vicenzo Nibali would take advantage of those two marking each other on stage 2 and attack for the stage victory and race lead before the race had even reached France. Following their respective injury led departures from the Tour it was Contador that claimed the ‘I probably would have beaten you at the Tour’ prize by knocking Froome over at the Vuelta. But the crucial point for Nibali in getting the VCSE nod over the Spaniard was his assured ride over the cobbles on stage 5 of the Tour. Surely the award of best rider has to go the one who demonstrated the greatest versatility and on a day where Contador appeared to be going backwards at times it was Nibali who emerged as the consummate bike handler. Legend that she is 2014 was not the greatest year for Marianne Vos. True there were victories in the races she outright targeted; the inaugural Women’s Tour and Le Course but she was more of a peripheral figure this year. Lizzie Armitstead may not have expected to win the World Cup after her stunning early season consistency but win she did, further raising he profile outside of the UK. Then there was her Commonwealth Games gold against a field where (unlike the men’s race) Lizzie was up against a genuinely classy peloton. She may still rue the tactics that threw away an opportunity to win the worlds in September but looking back this has been a great year, no question. Based purely on seeing him perform at the final round of the Revolution series earlier this year (he had already won the worlds by this time). With the British teams focus on the four year ‘cycle’ towards Rio 2016 it’s perhaps not surprising that Pervis made Jason Kenny look (if not) ordinary, then certainly not the reigning Olympic champion. A vote here for Contador might look a bit strange after picking Nibali earlier but Contador gets the nod for his results over the entire season. For starters Contador beat Nibali (winner of the previous two editions) easily in Tirreno Adriatico as the season was getting underway and long before his return from injury to claim his second Vuelta in three years. Throughout the year, Contador had the edge over his main rivals and he looked like the rider to beat ahead of this years Tour. We really only saw the briefest of flashes that Alberto was stronger than Nibali with his dig in final metres of stage 9, but by the next day he was gone. Of course, Nibali was not really seen as much of a threat before the race got underway, chief rival Froome never looked as if he had the confidence to seriously challenge Contador at the Tour. The gap between the two (in 2014 at least) was emphasised at the Vuelta. Winning his home grand tour may have provided some satisfaction after the disappointment of injury at the Tour but that’s the race you have to suspect Contador will want more than anything in 2015. Considering that it has provided more drama than the Tour (if not the Giro too) in the last few years the Vuelta remains the poor relation of the grand tours; threatened with a reduction in length or used as a training block for the world championships that follow. So the final stage was a bit of anti climax, what preceded it had it all with a GC contest going to the wire again. OK, it’s true that we probably wouldn’t have seen Contador or Froome at the race without their respective Tour exits but the fact is they were. The resulting battle the Sky power meter and Tinkoff street fighting provided the kind of stage racing the Tour often lacks. The Vuelta has to be the antidote to the Tour if it’s to survive in this format. The parcours and the field can throw up an unusual result (as with Chris Horner in 2013) and while it won’t ever enjoy the sheer scale of the Tour, at the moment at least, it’s the better race to watch. A close run thing with Paris Roubaix but on the basis of the Ronde literally going down to the final kilometre it has to be Flanders. 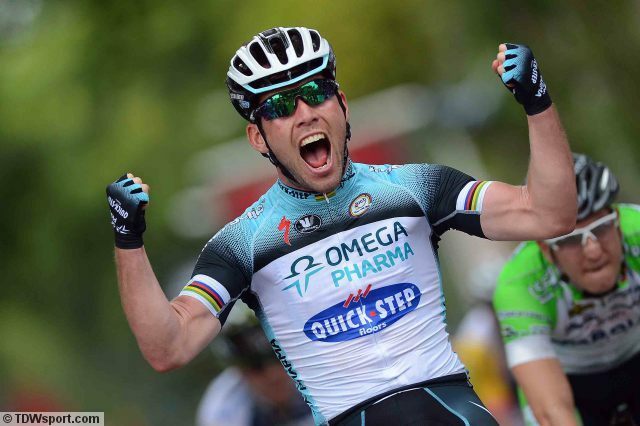 With at least one more year of the Cancellara and Boonen rivalry to enjoy it’s going to take a Wiggins win in Roubaix to knock Flanders off the top step in 2015. Grand tour winner? Check. Colourful team owner? Definitely. Up and coming new rider? Another tick. Strength in depth? In spades. 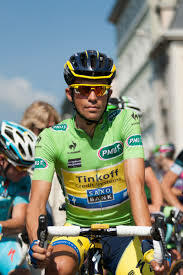 Tinkoff Saxo showed that they could do most things better than their rivals in 2014. Losing team leader Alberto Contador on the Tour didn’t see the implosion that overcame Sky who lost Chris Froome almost a week earlier. Instead Tinkoff took stage wins and claimed the KOM with Rafal Majka. Bjaarne Riis selling up to Oleg Tinkoff pre season was just one of the ingredients that made Tinkoff the team of 2014. Astana might have had a look in but that outfit looks increasingly schizophrenic with Nibali and Aru struggling to balance out a slew of failed drug tests. Tinkoff can look forward to the arrival of Peter Sagan next year to rev up their one day prospects too. Silly question. Have you seen my Instagram? Could have said Di2 XTR here, but on reflection the introduction of in race technology (most pertinently on bike cameras) might presage better ways of presenting the sport. Watching a stage race live and actually getting excited before the final 10km is completely dependent on what’s at stake. It’s hard to get too jazzed about a flat transitional stage or any part of the Tour of Alberta (for example), which seems entirely based on arrow straight roads across featureless plains. Showing on bike footage, either live or previous days highlights could prove really useful in providing some colour to the bits in between. Same goes for the live timing used during the TT at the worlds’; actually made watching a time trial live interesting. This was so nearly a “don’t know”. There were plenty of memorable moments to choose from; an exciting year in the classics, Quintana winning the Giro, Contador coming back to win the Vuelta, Jens taking the hour record. The unfortunately named ‘Big Start’ of the Giro was successful but perhaps lost something as a spectacle due to almost constant rain and sprint finishes. The Grand Depart on the other hand enjoyed blissful climatic conditions and the kind of public enthusiasm that we do in the UK since the Olympics. No one could have predicted just how many would turn out for a glimpse of the Tour. And this wasn’t just in the places you expected. 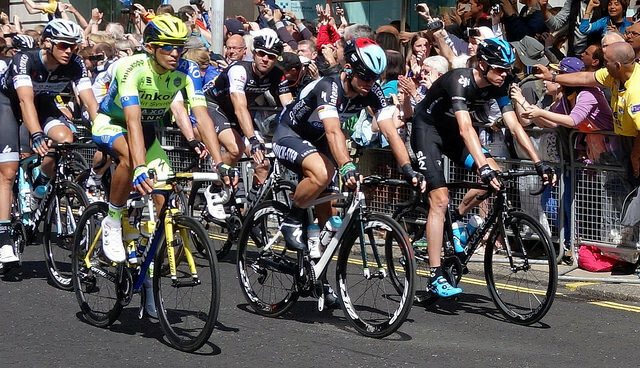 Crowds four and five deep on a straight section of Essex A road as experienced by your correspondent on the stage into London showed just how popular the sport has become. It lights the touch paper for further friendly incursions by the Tour and potentially the chance of finally over coming the difficulties in staging closed road races here. There’s no such thing as a dull finish at the Vuelta. One of the things that makes the supposed runt of the grand tour litter so exciting each season is that no matter how uneventful the proceeding kilometres may be the finish always seems to spring a surprise with an uphill drag thrown into a stage that’s supposed to favour the sprinters or some other cycling curve ball. Take stage 6 (one of VCSE’s stages to watch) where the final was a relentless climb of nearly ten percent without so much as a curve to distract the peloton that they had only one way to go; straight up. 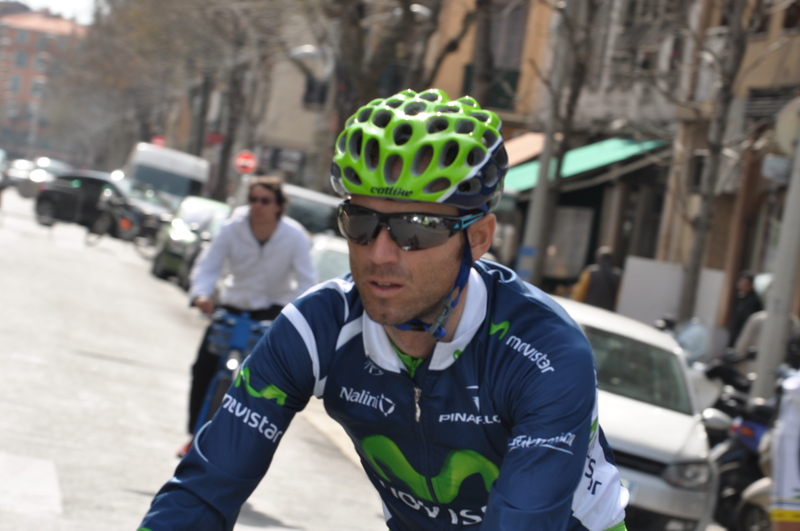 Alejandro Valverde – Hinault to Quintana’s Lemond? Tomorrows stage (with another summit finish) to Aramon Valdelinares with its 3,2,1 countdown of categorised climbs may mix the GC up again but it’s entirely possible we’ve already seen the protagonists for this years race when we look at the stage 6 top ten. Joining the Movistar pairing were Chris Froome, Alberto Contador, Joaquim Rodriguez, Fabio Aru and Robert Gesink. At one point it look as if Purito was going to claim the stage win, but it was Valverde who set the pace pretty much the whole way, shedding riders with GC pretensions all the way including Wilco Kelderman and Rigoberto Uran. Of course another ‘story’ that’s been cooked up for this race is the supposed re-match between Contador and Froome. The Sky rider has played down his own chances this week and while he possibly ‘only’ looked at 95% on the stage 6 finishing climb his condition doesn’t look like the issue. What is becoming a bit of a problem is Froome’s bike handling and he came off the bike again on yesterday’s stage. There’s some suspicion that the accidents that have befallen him are a result of his stem fetish; Froome’s constant glances at his power meter can mean that his eyes aren’t on the road (and the rider immediately in front of him) at crucial moments. It certainly looked like the Sky team leader was being carefully shepherded by his domestiques on today’s stage. 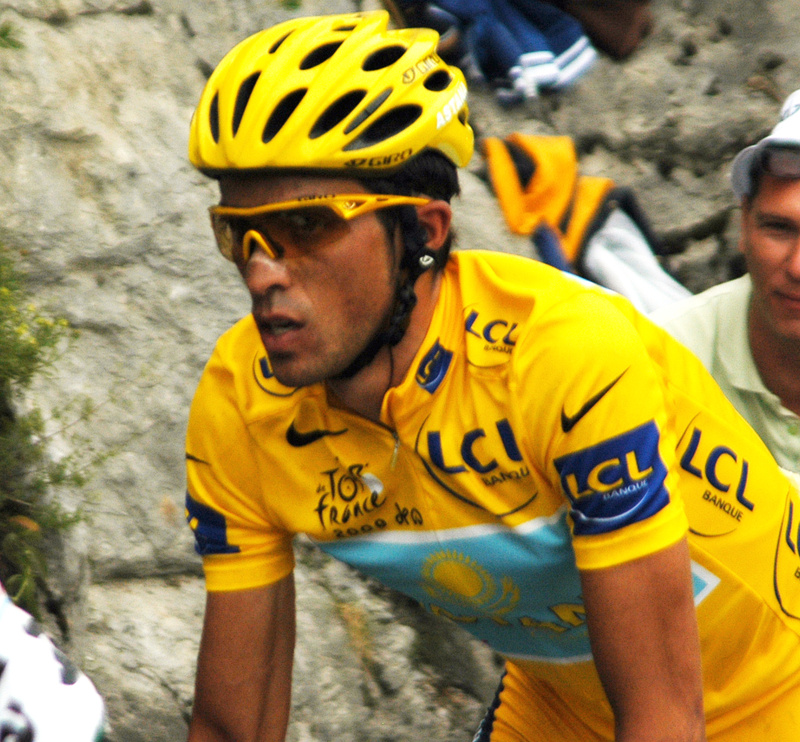 Contador as predicted has been low key, but more importantly never far from the action so far. With one stage to go until the rest day the Tinkoff rider lies in third place 18 seconds behind Valverde and two ahead of Froome. Rodriguez, Aru and Gesink also make the top ten with the current surprise package, Orica’s Jhoan Chaves in 5th place. The early race lead, taking over from Valverde after winning stage 3 was Chave’s teammate Michael ‘Bling’ Matthews. He add’s the race leaders jersey from the Vuelta to the one he gained earlier this year at the Giro and in some way it might make up for his last minute withdrawl before the start of this years Tour. Matthews lead was set up by a typically strong team time trial performance from Orica, but the surprise package from the opening stage was Movistar who won against more fancied opposition. Matthews held the lead until stage 6 and has placed well on the other ‘flat’ stages. VCSE’s sprint pick John Degenkolb has two stage wins so far equalling FDJ’s outgoing sprinter Nacer Bouhanni who just pipped Matthews today. The only ‘surprise’ win in the first week was from breakaway specialist Alessandro De Marchi who gave Cannondale a nice sign off in the current incarnation with victory on stage 7. VCSE doesn’t expect the top four to change in terms of riders tomorrow, but the order might do. The good news is that Froome and Contador both look as if they’re going to play their part in this years Vuelta to the full and that could mean a trio of grand tour winners on the podium in two weeks time. Maybe a follower from the US can help out with this one? Why is it that so much coverage of US races falls over due to picture break up? During last weeks USA Pro Challenge in Colorado we lost coverage for most of one stage (at least the part that was meant to be televised) and large sections of others. This was blamed on weather conditions and the altitude, but picture break up is a feature at most of the races were coverage is picked up from a US host broadcaster. This is disappointing as much of the rest of the coverage (the on screen ‘ticker’ that shows race position etc.) is excellent. The racing too is very often exciting, save for the inevitable intermediate parts of the stage that have to use arrow straight highways. 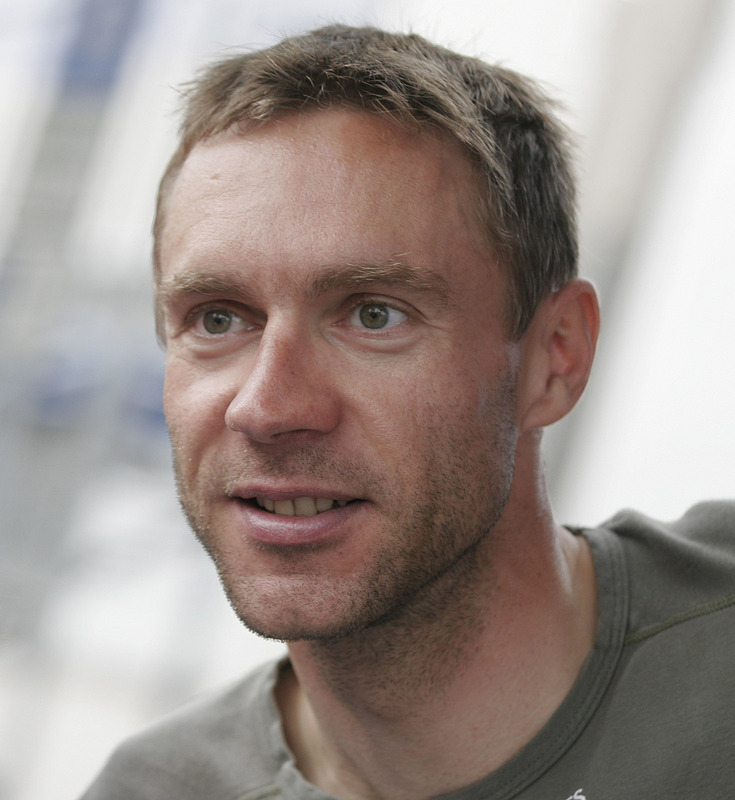 Fortunately one of the stages that wasn’t overly effected by transmission difficulties had Jens Voigt in his farewell race in the kind of break that made his name and indeed his ‘Shut up legs’ catchphrase. We were denied a fairytale finish when Voigt was caught within the final kilometre but as may said at the time it was probably fitting that things didn’t quite come off. Voigt leaves the sport undiminished as a rider from the generation that has been most vilified for the doping that signified the period. Voigt, when asked, has always vehemently denied any involvement in PED’s and it’s to be hoped that the rider remains the exception rather than the rule in retirement. As someone who has been such a great marketing tool for Trek worldwide it wouldn’t be difficult to imagine how disappointed his fans would be he turned out to have feet of clay like his erstwhile Trek ambassador Lance Armstrong. It was interesting to hear that Voigt apparently polarises opinion, with some fans critical of the way this years USA Pro Challenge had been trailed (at least in part) as a valedictory event for the rider. The VCSE standpoint is that Voigt is a character and in an increasingly anodyne sporting world cycling (any sport in fact) needs characters. Compare and contrast Bernard Hinault or Jacques Anquetil with today’s riders and you get the idea.